What are you doing tomorrow night? If you happen to be in the North Shore area, you should swing by ArcWorks Community Art Center in Peabody for the opening night reception for CREATE: The Art and Craft of Boston Handmade. 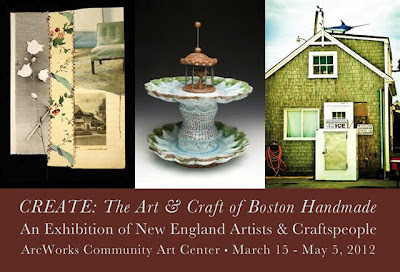 I am participating in this show with a few framed pieces from my Boston Harbor Islands series. Also exhibiting are Kerrie Beck, Jessica Burko, Allison Fraske, Kerry Hawkins, Arthur Halvorsen, Karen Mahoney, and Lynne Parrella. If you can't make it tomorrow night, that's ok! The show will be up until May 5. For more information, visit our event website here.